Every two years, WWF publishes the Living Planet Report, a science-based analysis on the health of our planet and the impact of human activity. Global Footprint Network contributes the Ecological Footprint assessment as a measure of human demand. 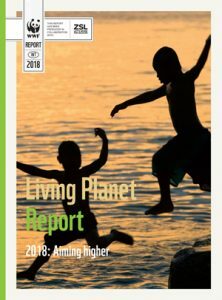 The Living Planet Report uses the Ecological Footprint and additional complementary measures to explore the changing state of global biodiversity and human consumption. The Living Planet Report 2018, released October 30, 2018, shows that the over-exploitation of ecological resources by humanity has contributed to a 60 percent plunge in wild vertebrate populations from 1970 to 2014. The top threats to species identified in the report are directly linked to human activities, including habitat loss, degradation, and over-exploitation of wildlife. According to Global Footprint Network, humanity is currently using the resources of 1.7 planets to provide the goods and services we demand when we only have one Earth. Founded in 1826, the Zoological Society of London (ZSL) is an international scientific, conservation, and educational organization. Its mission is to achieve and promote the worldwide conservation of animals and their habitats.